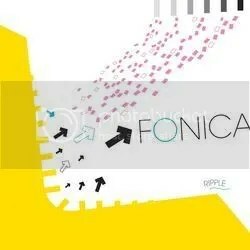 Let’s get all of my overused adjectives out of the way before discussing Fonica’s Ripple LP. It is pastoral, soothing, mellow, gorgeous, ethereal, otherwordly among other suitable ways to describe the music of this Japanese duo. I’m being a bit of a wiseass about adjectives because it seems like all of my favorite albums attract such descriptions. Fonica puts me in that that blissful place that Stars of the Lid, Fripp and Eno’s Evening Star, Cocteau Twins’ Victorialand and William Basinski’s Disintegration Loops never fail to inspire. Never heard of the band in my life, but picked it up for two bucks in a local budget bin due to the fact that it was released by the excellent German label, Tomlab. It seems as if many folks sympathetic to the sound of drones and whirrs haven’t yet encountered what may be one of the unsung classics of the genre. That’s a shame since Ripple is a special album that sounds like its contemporaries, but repeated listens reveal layers upon layers of intricacy that push it beyond the reach of its peers. I believe Fonica is no more, but Keiichi Sugimoto continues to mine similar veins with his work as Fourcolor, Minamo and Filfla. I like the Fourcolor and Minamo albums quite a bit and they are worth investigating, but his work on Ripple has this childlike quality to it. Each song is simplistic, repetitive lullaby that slowly reveals more elements until you are entranced by each creation. The title of this album is apt because each instrument, drone and muffled beat does indeed ripple outward in minsicule gestures and waves. On my most hectic, hair-pulling days, I can always count on Ripple to loosen the knots and focus the mind on better places and states of mind. I hope it can do the same for your troubled soul.